In 10-inch skillet, cook turkey and onion over medium heat 6 to 8 minutes, stirring occasionally, until sausage is no longer pink. Stir in garlic. Cook 1 minute; drain. Stir in tomato sauce, basil, Italian seasoning and salt; set aside. Line 5-quart oval slow cooker with plastic slow cooker liner. Spoon 1 1/3 cups sauce mixture into bottom of slow cooker; spread evenly. Top with 5 lasagna noodles, breaking up as necessary to fit. Spread with half the cheese mixture; repeat once with sauce mixture, noodles and cheese mixture. Top with remaining 5 noodles and remaining sauce mixture, making sure to completely cover noodles with sauce. Cover and cook on Low heat setting 4 hours. Turn slow cooker off. Sprinkle remaining 1 cup mozzarella cheese over top of sauce and noodles. Cover; let stand about 10 minutes or until cheese is melted. Uncover; let stand 10 minutes longer to set. Gently lift lasagna out of slow cooker onto cutting board, using plastic liner. Cut into slices. Serve immediately. Gluten-free Italian turkey sausage can be substituted for the Italian seasoned ground turkey. 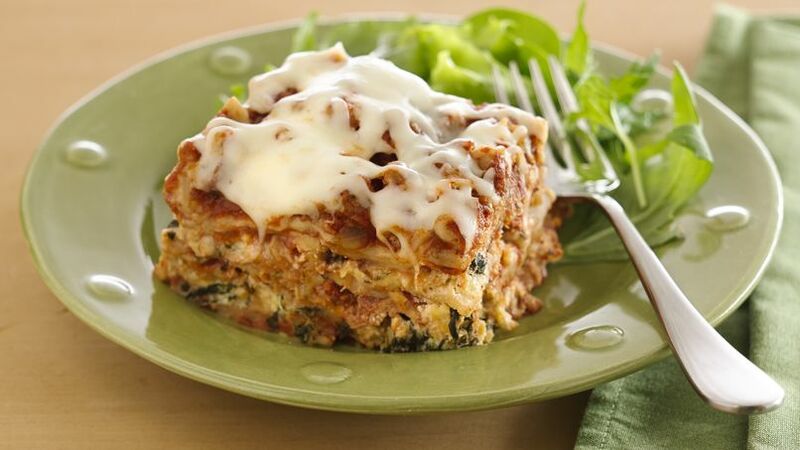 Enjoy home-cooked gluten-free lasagna any day of the week! Thanks to the slow cooker and no precooking of the noodles, this family friendly dinner will be ready when you are.